Rangers will play Celtic in the Scottish Cup semi-finals while Hibernian or Inverness Caledonian Thistle will play Dundee United. The ties will be played on the weekend of 16 and 17 April. Championship leaders Rangers beat Dundee 4-0 before United claimed a dramatic 3-2 win over Ross County. 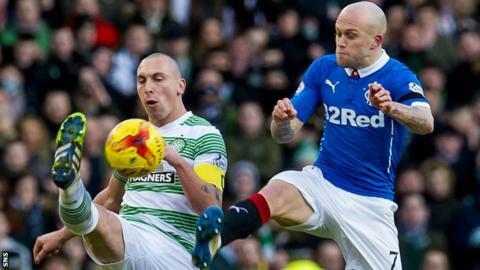 Premiership leaders Celtic won the first of Sunday's quarter-finals, overcoming Greenock Morton 3-0. Hibs and Inverness later drew 1-1. Holders Inverness will host Hibs in their replay on 16 March. Hibs, third in the Championship, were knocked out by Falkirk at the last-four stage in 2015 and will play Ross County in next Sunday's League Cup final. Celtic beat Rangers 2-0 in last season's League Cup semi-final and went on to win the tournament. However, Ronny Deila's side, who won last season's top flight, lost their Scottish Cup semi-final against Inverness with the Highlanders then beating Falkirk in the final. Rangers - currently 12 points clear at the top of their division - were beaten by Dundee United in the 2014 cup semi-final. The Tangerines lost that year's final to St Johnstone. Ibrox manager Mark Warburton told the Rangers website: "I understand it is a big game and a big event, and I understand there will by media hysteria, but from our point of view, that game is a long way off and between now and then, we have a lot of work to do in our league campaign." And Celtic forward Leigh Griffiths, who scored against Rangers in last year's meeting at Hampden, said on Twitter: "What a draw...lets hope it's the same result as last time. Few big games before that though...hopefully today was a start of something." Ties to be played on the weekend of 16/17 April.